This couple’s dreamy pre-wedding shoot by Studio Roopkala has caught our latest fancy. Picturesque locations, vintage photo shoot props and outfits that inspire! This pre-wedding shoot held in the outskirts of Vasai and across the widespread beauty of Gorai beach was the best kinda one we’ve seen in a while. Shristi and Harsh decided to get away from the hustle and bustle of the big city life and have their pre-wedding photo shoot in rustic locations, amidst torn down walls with cute photo props, Viral Dharod of Studio Roopkala brought about a perfect vibe of an old world charm. Monochrome pictures at the beach - Always a good idea! Cute vintage pre wedding shoot props that include a gramophone, polaroid camera, and rustic-floral table cloth. 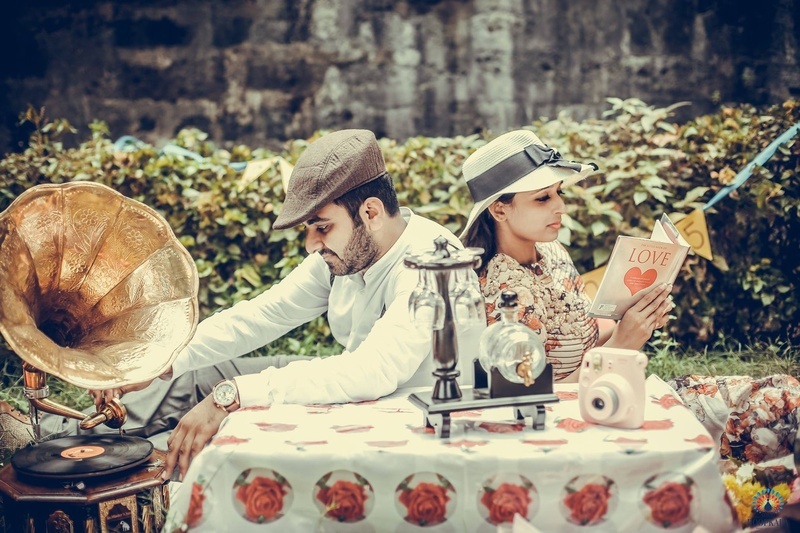 Old-school gramophone for Harsh and Shristi’s pre wedding photoshoot. Oranges and Grey - Outfits perfectly matched to their vintage pre wedding shoot. #dhoklawedsdalbaati - Quite the perfect Wedding Hashtag for a cross-community wedding, don’t you think?! Vintage crop top and skirt with stunning floral prints. Reading The Little Book Of Love – an unusual yet adorable photo prop for the pre wedding shoot! Perfectly cute Save The Date Ideas! Romantic pre wedding shoot by Studio Roopkala at Gorai Beach.